The Cover Contessa: FEATURE FRIDAY! Today marks the first day of my newest feature: Feature Friday. Every Friday I will feature another blogger on my site so you can get to know them and their blog! What a great way to get their blog out there and for you to get to know another blogger better! This week I am featuring Zuleeza Ahmed. 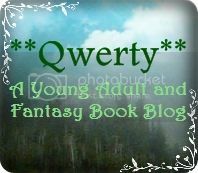 Zuleeza's blog is called Qwerty, clever, no? "a socially awkward penguin by day, a ninja assassin book reviewer by night...."
No crying on my blog! The Star Dwellers (Book 2 of The Dwellers Series) by David Estes. Haha. I think this interview will go live first before the cover reveal, so I can’t really answer this. But it follows that the cover will look awesomesausages like The Moon Dwellers too! CANNOT WAIT for this cover reveal! Hmm..not sure David would agree with being a Cyborg, but it's a good hypothesis! Gotta love those feisty characters! It's hard not to like all his characters, no? It is a series and I’m going to read the entire series for sure! kind of clouded my judgment, but now I received them regular enough so it’s no longer an issue. At the end of day, I point out what I dislike about a book to help the author gets better anyway! It's important to have that distinction! Dwellers is twice better than the beta version, so it’s 16 stars! Better than the first? Oh I cannot wait! build up my career first. And I don’t really have any ideas yet! I bet the writing is not as bad as you think. There's probably a great story there! Love me some YA with first loves! might come in handy if the island is indeed populated with elves. worry about my life at night. Tolkien would be a great person to meet! them. So I guess my current preference is ebooks. Ebooks are a new hobby for me! LOL! level of suffering. What to do, I got no moneiz. Way too fast, I agree! once I read the books, they are actually better! Entwined by Heather Dixon in paperback format. Can I add that the cover is so pweh-ty!!! Transcend by Christine Foncesa. Can’t wait!!! Fifty Shades of Grey. Nah, eroticas are just too weird for me. Didn't think I would like it, but I did, odd? review of The Falconer on Goodreads? It’s hilarious; I think I might drop my kidney somewhere. This is one of my three!!!! trailer had me fangirling so much! not 7.32 am or 7.41 am. this year is to read at least 75 books. Tea. Make it Earl Grey. Dessertsss!!!! I don’t need any meals as long as you can gimme dessertssss!!!! The Big Bang Theory and Inception. Centipedes. I’m serious. I don’t mind snakes, spiders and roaches but not centipedes.